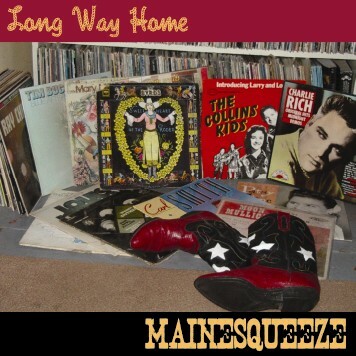 After Over 30 Years Together, Well-Known New England Seacoast Band, MAINESQUEEZE Releases First CD, Long Way Home! Long Way Home had been a long time coming but worth the wait for fans of MAINESQUEEZE. Talk about recording had been going on for years but the project is now complete. According to band members, they were looking to keep a live feel to the recording by singing duets and harmonies together instead of recording them on separate tracks. Some of the instrument tracks were also recorded in this way. The songs cover everything from old 30’s tunes such as, “I’ll Never Be Free” (Tennessee Ernie Ford and Kay Star) and “Blues You Never Lose” (the Delmore Brothers) to Texas-swing tunes, “San Antonio Rose” (Bob Wills) and “Texas Swing/I Don’t Want to Live in Texas” (the only original by band member, Sammie Haynes). There are nifty renditions of the once pop tunes “Down in the Boondocks” (J. South) and “Sea of Heartbreak” (P. Hampton/H.David). Other songs include: “What's the Matter with the Mill” (Memphis Minnie McCoy), “Tryin' to Get to You” (Singleton, McCoy), “Crawdad” (Big Bill Broonzy), “Way Over Yonder in the Minor Key” (Woody Guthrie & Billy Bragg), “Across the Great Divide” (Kate Wolf), “If I Needed You” (Townes Van Zandt) and title cut, “Long Way Home” (Tom Waits).